The red crossbill has at least 8-9 distinctly recognized subspecies, and further research may indicate many more individual races. They show significant differences in bill size, song, range, tree preferences and size, and it is possible that this bird will one day be split into several different species. Markings: Dimorphic species. Males are brick red or red-orange with a gray wash on the lores and auriculars, and some gray may show on the flanks. The wings are black and the tail is black-brown. The undertail coverts are whitish-gray with dark streaking or spotting. Females are olive-yellow with a paler or whitish throat and a brighter yellow rump. On both genders, the eyes are black and the legs and feet are blackish-gray. Juveniles are brownish and show streaking both above and below, though the streaks may seem stronger on the pale whitish or buff underparts. Young birds often show two thin wing bars. At first their bills are straight, but they begin to develop the characteristic crossover shape when they are 4-5 weeks old. As they mature, juveniles resemble adult females, and young males will develop a blotchy mix of yellow and red on their plumage as they continue to mature. These chunky finches are at home in coniferous or mixed forests. They are widespread through North America, Europe and Asia, and generally do not migrate. Red crossbills can be highly nomadic as they seek out the richest cone crops, however, and when crops are poor, these birds become irruptive. Even without a widespread irruption, a few vagrant sightings are likely to be recorded south of their expected range each winter. These birds are year-round residents of Canada's boreal forests from southern Alaska east to Newfoundland and Labrador, and their North American range extends south through the western Rocky Mountain ranges and central Mexico into Honduras. Red crossbills are found at similar latitudes and in similar habitats throughout Europe and Asia, including Scandinavia, Spain, Turkey and India, though their populations in southern areas are more fractured and isolated. During the summer breeding season, they become more widespread throughout Siberia, and in winter some Asian populations migrate to Japan and northeastern China. Similarly, some winter populations in North America spread throughout the United States, though they are absent from the southeastern part of the country and southern Texas. Red crossbills call frequently in flight with pleasant chirping notes. Their typical song is a warbling, chirping sequence of 3-4-2 or 4-4-2 syllables, changing pitch, spacing and tonal quality slightly with each part of the sequence. These birds are generally seen in pairs or small flocks. When foraging, they are agile and acrobatic, climbing over pine cones or dangling upside down while using both their feet and bills to grip. They wedge their bill into a cone to force the cone's scales apart, and use their tongues to sweep the seeds into their mouths. These crossbills will also visit salt licks and are often seen at the side of rural roads in winter, where they may be gathering salt or grit. These are monogamous birds. The female builds a bulky, cup-shaped nest using twigs, grass and bark, lining the cup with finer grasses, moss and fur. The nest is positioned 6-40 feet above the ground, concealed in a clump of pine needles well away from the tree's trunk. The oval-shaped eggs are pale whitish or very light blue or green, and are marked with fine lines or specks in brown or purple shades. Markings are usually concentrated at the larger end of the egg. The female incubates the eggs for 12-18 days, during which time the male brings her food. After the altricial chicks hatch, the male continues to feed the female for several days while the chicks are very young and vulnerable, but as they grow both parents will forage to feed the nestlings. There are 2-5 eggs in a brood, and a mated pair may raise 1-2 broods each year. 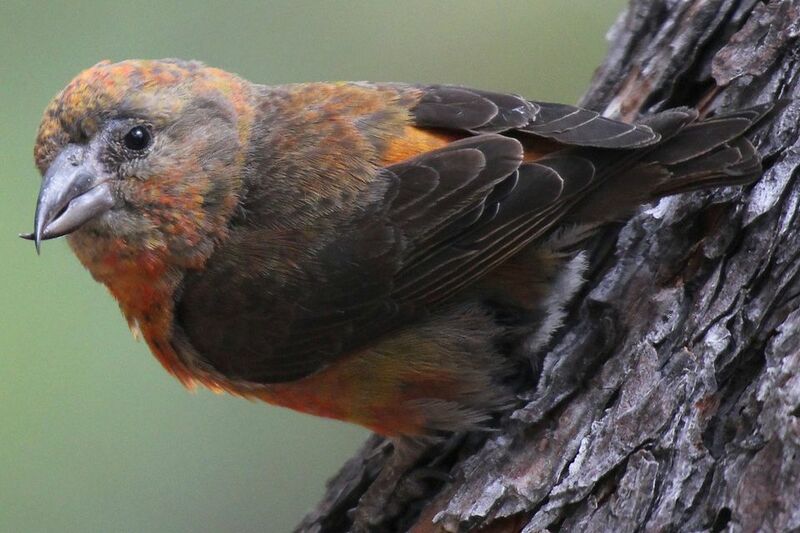 Because red crossbills depend on rich food sources to feed their young, they may begin breeding as early as late January or early February when cone crops mature. These finches can be curious about humans and will visit feeding stations where black oil sunflower seeds are available. With their powerful bills, they are also easily able to break into larger striped sunflower seeds. Planting evergreen trees in the yard will also help attract these birds. Cone-bearing varieties of fir, spruce, hemlock and pine are especially attractive. While these birds are not considered threatened or endangered, they are at risk from habitat loss in areas where logging and development are reducing coniferous forests. In some regions, they are losing food supplies to introduced squirrels. The greatest concern is that if these birds are split into different species, crossbills with restricted ranges or precise habitat needs could immediately be considered threatened or endangered. Because of that, it is critical to ensure these birds are protected in all parts of their range.